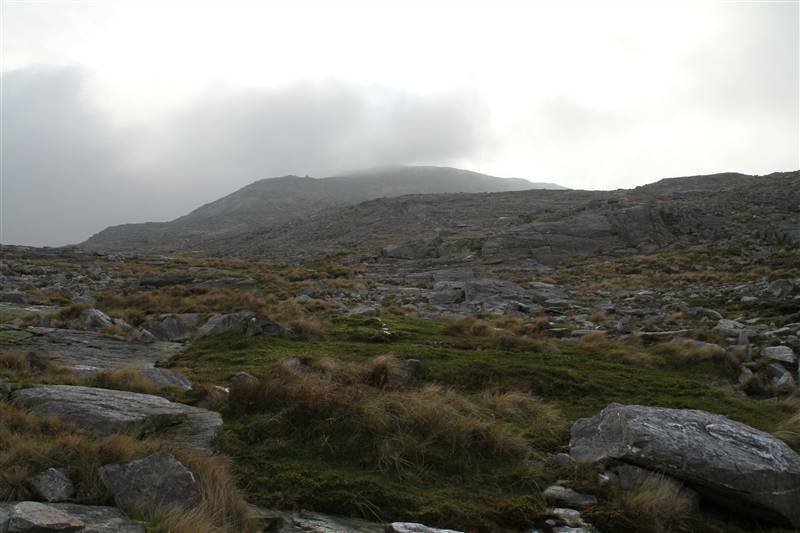 At 729 Meters Benbaun is the highest point in county Galway. 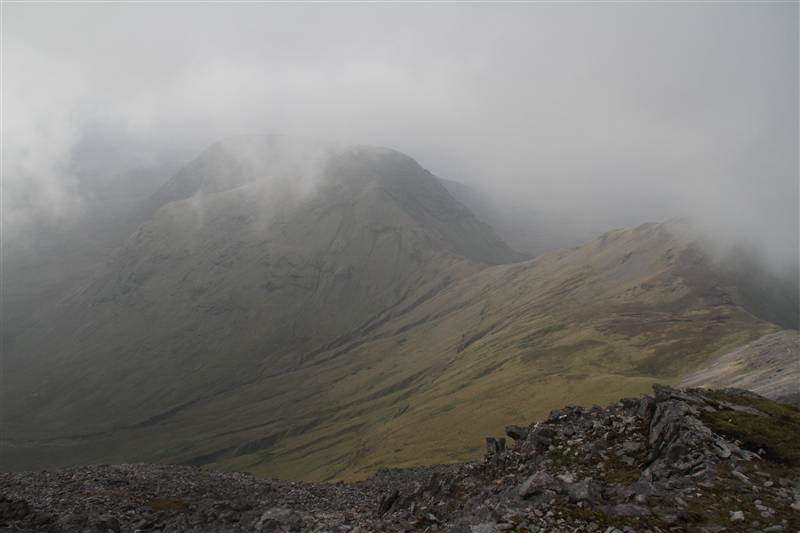 It’s also the highest peak in the Twelve Bens or Twelve Pins in Connemara, a range of mountains that offer a wide variety of sometimes challenging terrain in a remote and beautiful location. Our walking route for Benbaun which started and finished in the Glencorbet valley took 4 1/2 hours. One of the first things to note is that if you are coming from Dublin you can access this part of the country quicker than ever now that there is motorway all the way to Galway. My pal Ross and I left Lucan at 0940 and were walking away from our car in Glencorbet at exactly 1pm, giving a journey time of 3hrs excluding a pit stop for coffee. So with an early departure a long day’s walking in Connemara is now quite possible. 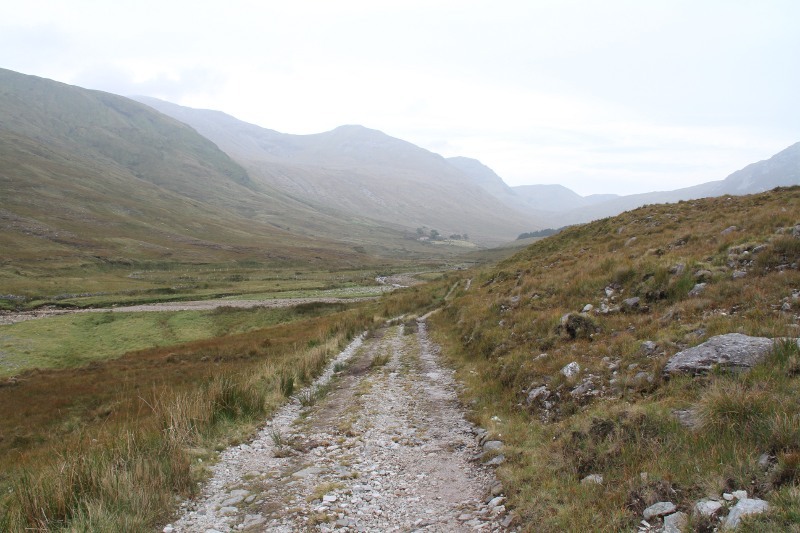 The trail into Glencorbet. Photo by Ross Whitaker. En route to Benbaun, hopping over the Kylemore. Photo by Ross Whitaker. From here we continued to follow the path up through some atmospheric ruins beside a remote farmhouse. While passing through we bumped into the farmer who was perched against one of the fallen buildings checking on his sheep with his binoculars. The sheep were fine, he said, and we were welcome to walk in the area. Open hillside as we head towards Benbaun from Glencorbet. Photo by Ross. 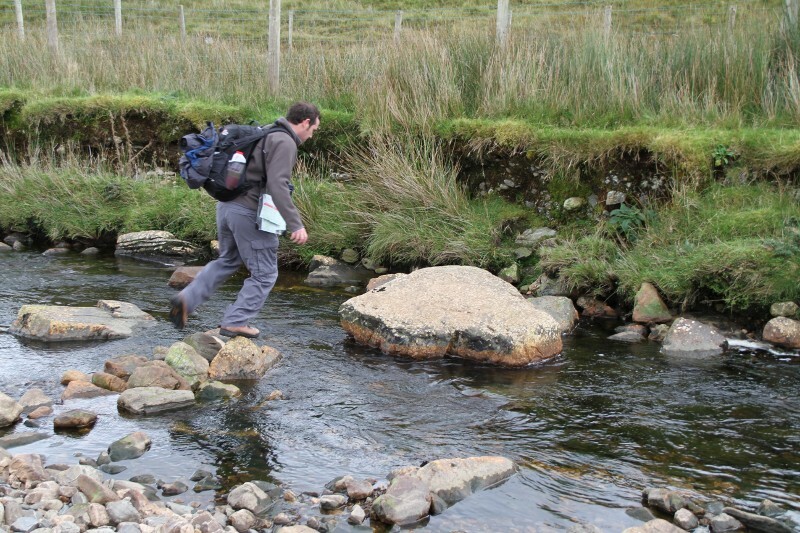 During my research for this walk I had selected a route from Joss Lynam’s Best Irish Walks which takes in Muckanaght before passing over Benfree to get to Benbaun. I had also printed off a handy guide entitled Benbaun circuit from Glencorbet from MountainViews.ie which outlines a similar but slightly shorter walk. However as it felt a little late in the day and the promised indian summer weather had not materialised we decided to push for the summit and consider our options once this main objective had been achieved. This correctness of this decision was confirmed shortly after when we met a descending group of hardy Ulstermen who were calling it a day after enduring severe winds at higher altitudes. So, we commenced our ascent along the descent route of the northern party [L785555], travelling almost directly south up steep slopes and gradually moving away from a stream we had crossed lower down. A steep climb towards Benbaun. Photo by Ross Whitaker. After a steep climb from the valley, Benbaun comes into view. RW. This final pull was quite steep indeed with very strong gusts of wind coming from our left. With nothing but bare rock and shards of scree on the ground it was curious to see how there was no vegetation at all on this upper slope to stir and give evidence of the wind that was howling past. After twenty minutes of so of ascent the ground levelled off and two minutes more brought us to the smashed trig point at the top. Occasional the clouds tumbling into the vortex in the lee of the summit broke and we could see dramatic views down towards Muckanaght, Benfree and the winding stream in the valley below. Stunning country, a shame we couldn’t see more of it. A break in the cloud reveals Benfree and Muckanaght. Photo Copyright Ross Whitaker. With the gusting wind and cloudy views we didn’t hang around, turning to retrace our steps back down towards more level ground. With both of us slipping once or twice on the loose scree – and Ross narrowly avoiding bashing his new camera in the process – we concluded that this was not the ideal place to find out what happens when you take an injury. Strangely enough, just two days later I hurt my ankle pretty badly hopping off a three-foot fence near my home. The pain was unbelievable and it took me an hour to make the normally ten minute journey home. I’d hate to think how long the walk out would be if one got hurt high in the hills. Once the ground levelled off we headed South East to a point where we could admire Bencollaghduff, Bencorr and Bencorrbeg on the otherside of the Gleninagh valley. With their near vertical faces they looked most unwelcoming and illustrated how wild and isolated this part of the country feels. At this point we hiked to the North until we could begin to see back into Glencorbet, before swinging North East to walk out along the Knockpashemore ridge. The going along here was slow with some deep depressions between peat hags. 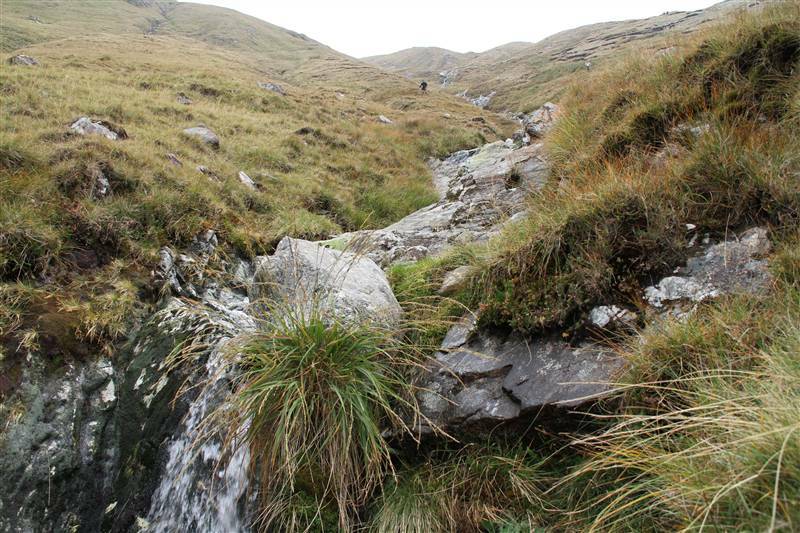 We didn’t do ourselves any favours by contouring below the top of the wide ridge on the Glencorbet side, thus having to negotiate some severe indents made by streams as they flow down the hillside. We did manage to shake a prowling fox out of some long grass though. This wonderfully healthy looking animal took off up the hill running straight past the sheep we presumed he was stalking before our rude interruption. We chose to descend following the course of a stream [L794555] that was almost directly above the place where we had earlier crossed the Kylemore, arriving back at the car after 4 1/2 hours, including about 40 minutes of stoppage time. This was a fine walk that was let down by poor visibility and our not having time to cover as much ground as we had planned. I had led Ross to believe that we were in for an epic hike in wild, spectacular country, and while the potential is clearly there our day in the Twelve Bens didn’t quite deliver. I’d love to revisit these hills, particularly as so many of them (Bencollaghduff, bencorr and others) receive such high-ranking in the MountainViews’ best rated Irish mountains list…maybe next year when the county tops are all completed I’ll take a hike down there at leisure. Below you’ll find an image of the parking spot and the track from Google Streetview. Be aware that this is a pretty remote area with a fair deal of steep ground. You’ll definitely need map 37 to get around and you’ll need to be able to navigate. While you are not supposed to rely on phone coverage to dig yourself out of a scrape it’s still nice to know that you could make an emergency call if you needed to. Well, not in the Twelve Bens. I’m on the 02 network and had no signal for the day once we turned off the main road. Ross is on Vodafone and seemed to have coverage all day, so bring him or another Vodafone customer with you if you plan on taking a fall. As ever, there are plenty of tips on Benbaun and the walking route referenced above to be found on MountainViews. Routes featuring Benbaun are also covered by Joss Lynam in Best Irish Walks and Paddy Dillon’s Mountains of Ireland. well Done. The ‘streetview’ is blilliant. How was the foot ?? This walk was done before Ankle-gate so all was well. I hope to be ready to head back out around the first weekend of November. love the photos. Have you heard of the Bayer 100 challenge? For APA (Aid Partnership with Africa) and covered the highest peak every county in 100 hours. Managed in 2008 in 104 hours but didn’t get to savour the journey or the views from any of the peaks! I think it may be running next year, you could condense your 2010 into 100 hours in 2011! That’s sounds A) Great and B) painful! This was no. 20 in my list and did it today. Like yourself Murray had hoped to do the Joss Lynam route but cut it short! Cut out Mucknaght after reading reports of how tricky the grassy slopes can be in the wet and headed straight for Benfree and then the big one. The recent rain meant that the river was considerably higher than in your pic above and struggling to find a good spot to ford it I ended up in it to my knees and broke a pole! Still an absolutely brilliant walk, like yourself I didn’t have views from the summit but still thoroughly enjoyed it (apart from the midges, I was warned about them in the Bens and the warnings are to be heeded, as soon as the rain stopped they were out in force). I took one nice tumble myself on the descent, thankfully only a few bruises. You are dead right about the Vodafone reception, mine was that good at the summit that I was able to upload the 2MB pic I had just taken to facebook. Two friends and I are planning a round trip through ireland and we’ll also stay in Clifden for two nights. We want to go hiking around Kylemore Lough, and seeing your post made my feet really itch… The views are stunning! However, we are not very experienced in hiking/climbing mountains. I’ve been to the alpines a few times with my parents and we’ve climbed a few mountains, but I’m not so sure about my friends. We’ll definitely have the right gear (ankle supporting boots etc), but do you think a hike like this is possible for beginners? Thank you so much in forward! I’m not sure that hiking in the Bens would be recommended if you don’t have much previous experience. 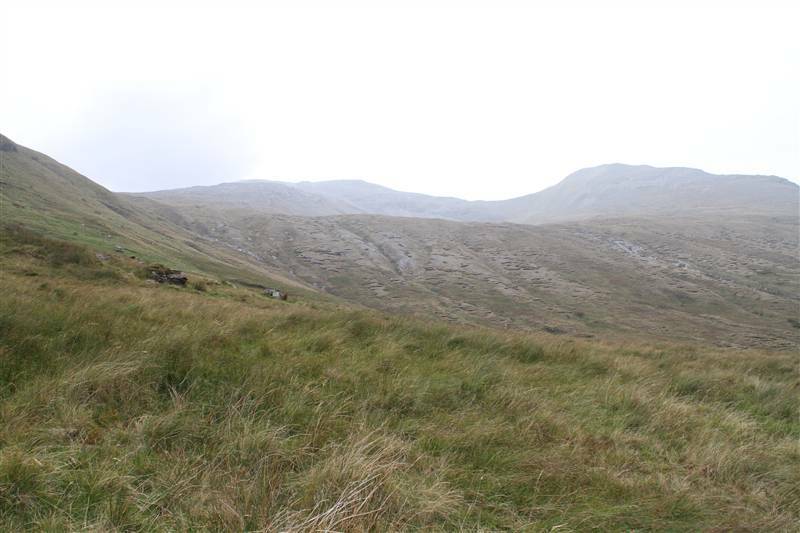 The Bens, like many mountains in Ireland, are untracked so you would not be following a marked trail. While this is part of the attraction for hikers in Ireland, it means that if the weather turns you will need to rely on maps and navigation skills to get yourself down the mountain to safety. Perhaps you could use a guide like http://tourismpurewalking.com/ who will be able to show you some of the wonders of the area? In any case, I hope you and your friends have a great trip. Thank you Murray! Great write up. Had planned on climbing Binbaun but not after reading this. Very helpful with great detail. I came across your write up when searching for Hiking Benbaun. It’s super helpful. Thanks so much. My boyfriend and I are planning on hiking this mountain next weekend during our trip to Ireland. Quick question – we have hiked many times before and are very comfortable hiking, however we have never hiked using a map (there has always been a marked trail we follow). Is it obvious once you cross over the Kylemore river what peek is Benbaun? Do you think we can easily follow your steps above without using a map?